Enjoy this Sesame Asian Salmon Recipe with a stir-fried vegetable medley. 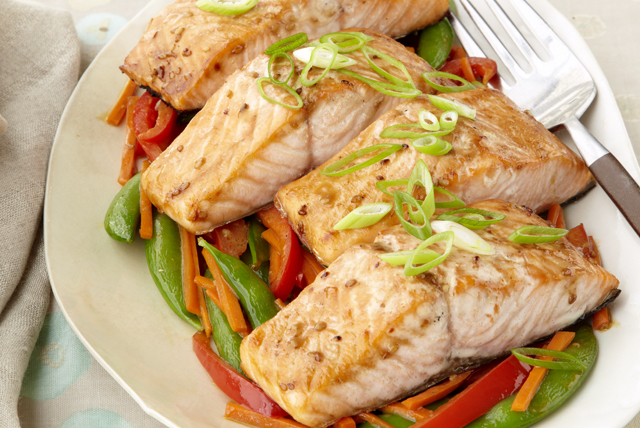 This Asian salmon recipe is a low-cal, low-sodium dish great for weeknights! Reserve 2 Tbsp. dressing for later use. Place fish on baking sheet sprayed with cooking spray; brush with remaining dressing. Bake 12 to 15 min. or until fish flakes easily with fork. Meanwhile, heat oil in large nonstick skillet on medium heat. Add next 3 ingredients; cook and stir 4 min. or until crisp-tender. Remove from heat; stir in reserved dressing. Spoon cooked vegetables onto serving plate; top with fish and onions. Add 1/2 cup bean sprouts or 1 drained 8-oz. can sliced water chestnuts to hot oil in skillet along with the carrots, peas and peppers.